The latest figures for October 2016 were released by the Statistical Institute of Belize (SIB) on Wednesday, November 30th. 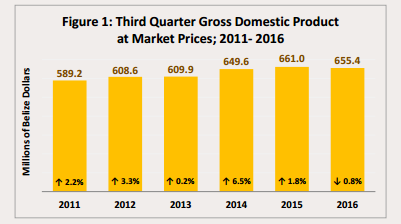 The figures show that the country has experienced three consecutive quarters of negative Gross Domestic Product (GDP) growth, and indicated that Belize's economy is still in a recession. The first quarter saw a contraction of 0.2%, the second, 1%, while the third quarter showed a contraction of 0.8%. The primary sector experienced a decline of 24% during the third quarter, when compared to the same period last year, with slumps recorded from several major industries. Marine exports fell by 61%, as the shrimp industry continued to struggle towards recovery. Due to the closure of one of the major banana farms and the effects of Hurricane Earl, banana shipments dropped by 14%, from 28 thousand metric tons to 24 metric tons. However, the only significant growth within this sector was livestock production, which rose by 7% as poultry, swine and cattle production all recorded increases in production. Secondary activities recorded an increase of 2% as a result of strong performance in “Electricity and Water”. Electricity generation increased by 7.9% compared to last year, with favorable weather conditions during the period positively affecting hydroelectric power production. Water distribution also recorded an increase of 3.8%. Production of beverages rose by 11.3% during the quarter, the result of a 24.7% increase in beer production. “Manufacturing and Mining” recorded a decrease of 0.9%, as crude petroleum extraction declined by 12.5% due to the natural depletion of reservoirs. The tertiary sector increased grew by 1.9%, which accounts for over a half of the country’s economic activities. As a result of approximately 12,000 more overnight visitors to the country, “Accommodation and Food Services” recorded an increase of 10.1% over the period. “Government Services” also recorded an increase of 4.4%. On the contrary, the “Wholesale and Retail Trade” sector recorded a marginal decline of 0.1% as imports decreased by 0.4 percent for the three month period. During the month of October 2016, all-items consumer price index stood at 103.6, an increase from 102.9 in last October. The price of goods and services purchased by Belizean households were increased by 0.7% compared to October 2015. Diesel prices increased by 21% from $7.05 in October 2015 to $8.53 in October 2016, while Regular gasoline prices rose by 13% from $8.25 in October 2015 to $9.32 in October 2016. For the second month in a row, a 26% decline in international airfares was not sufficient to offset the rising cost of fuels. As a result, the ‘Transport’ index recorded its second increase since the start of the year, up by 1.3% in comparison to October of last year. Due to lower prices in ‘Meats’ and ‘Milk, Cheese and Eggs’, food prices decreased by 0.2%. Within the ‘Food and Non-Alcoholic Beverages’ category, the average price per pound of ground beef decreased by 4.6%, while the price per dozen eggs fell by 11.7%. However, as a result of Hurricane Earl in early August of this year, prices for fruits and vegetables both saw increases on average during the month. The price per unit of plantains and limes rose by 9.5% and 27%, while tomatoes also increased from $2.39 per pound in October 2015 to $2.78 in October 2016. Imports decreased within all major categories, with goods destined for the ‘Export Processing Zones’ recording the steepest drop, from $13.8 million in October 2015 to $2.6 million in October 2016. However, decreased purchases of turbines, gaming equipment, telecommunications equipment, and structures made of iron or steel were among the items that saw the greatest decline. The total domestic exports for October 2016 decreased by 43%, which amounted to $21.7 million. Crude petroleum was the only major export to have performed more favorably during the month, with a $1 million growth, from $4.6 million in October of 2015 to $5.6 million in October 2016. Orange concentrate sales caused a slight decline in the citrus category, which dropped by over $1 million. Shrimp exports remained weak, causing sales of marine products abroad to diminish from $7 million to $4.1 million. The banana industry also saw a reduction in exports from $8 million to $4.2 million and sugar reported no sales for October 2016. In addition, merchandise exports for the first ten months of 2016 totaled $364.3 million, down 23.8% or $114.1 million from the same period last year. Export earnings contracted for all major commodities, with the exception of citrus, which grew slightly by 2.9% or $2.3 million over the ten month period. Marine exports also fell sharply by $49 million, a 62% plunge from the $79 million recorded for January to October of 2015. Unemployment also rose from 10.2 percent in September 2015 to 11.1% in September of 2016. That is more than 2,045 unemployed Belizeans. As Belize’s Public Debt currently stands at 100% of GDP, the statistics reveals even more economic hardships ahead. In the meantime, the next coupon payment of the 2038 Superbond is due in February 2017, and the Government of Belize is trying to restructure it to avoid a default. The full report can be viewed online at www.sib.bz.org.